The following Press Release appeared in today’s Alliance Review. As part of National Memory Screening Day, an annual initiative of the Alzheimer’s Foundation of America (AFA), Alliance Community Hospital (ACH) will offer free, confidential memory screenings on Nov. 19. Screenings will be held from 8 a.m. to noon. at ACH (200 E. State St., Alliance). Appointments are recommended and can be made by calling the Public Relations Department at 330-596-7575. (Screenings are held in 30 minute increments.) Diabetes and bone density screenings will also be offered during these times. Light refreshments will be available. Qualified health care professionals will administer the memory screenings and provide educational materials about memory concerns, brain health and caregiving. The face-to-face screenings consist of a series of questions and tasks, and take five to 10 minutes to administer. AFA suggests memory screenings for anyone concerned about memory loss or experiencing warning signs of dementia; whose family and friends have noticed changes in them; who believe they are at risk due to a family history of dementia; or who want to see how their memory is now and for future comparisons. Screeners emphasize that results are not a diagnosis, and encourage individuals who score poorly as well as those who still have concerns to pursue a full medical examination. Such screenings are becoming increasingly important as the number of Baby Boomers turning age 65–the at-risk age group for Alzheimer’s disease–continues to climb. The federal government’s historic “National Plan to Address Alzheimer’s Disease” urges a greater emphasis on both early diagnosis and education about Alzheimer’s disease and related dementias. However, an AFA survey of 2010 National Memory Screening Day participants found that 92 percent of those polled had never been given a screening by their primary health care provider; and 83 percent who were worried about their memory had not discussed their concerns with a health care provider. “Brain health should be on everyone’s radar screen, especially as you age. Memory screenings are a first but critical step toward finding out where you stand now and what additional steps you might need to take,” said Carol Steinberg, president of the Alzheimer’s Foundation of America. Some memory problems, like those caused by vitamin deficiencies or thyroid issues, are readily treatable and even curable. Others might be due to Alzheimer’s disease or a related dementia. Although there is no cure for Alzheimer’s disease, early intervention can improve the quality of an individual’s life; available medications may help slow progression of symptoms and diagnosed individuals can more readily participate in long-term care planning. Warning signs of Alzheimer’s disease include forgetting people’s names and events, asking repetitive questions, loss of verbal or written skills, confusion and personality changes. Dubbed by many as a “silver tsunami,” the number of Americans with Alzheimer’s disease is expected to triple to 13.8 million by mid-century. Advanced age is the greatest known risk factor for the disease, which results in loss of memory and other intellectual functions, and is the sixth leading cause of death in the United States. For more information about National Memory Screening Day, call 866-232-8484 or visit http://www.nationalmemoryscreening.org. Classes will start Wednesday, October 2 from 12:00-1:00 PM. A physician referral is needed. Open to employees and community members. 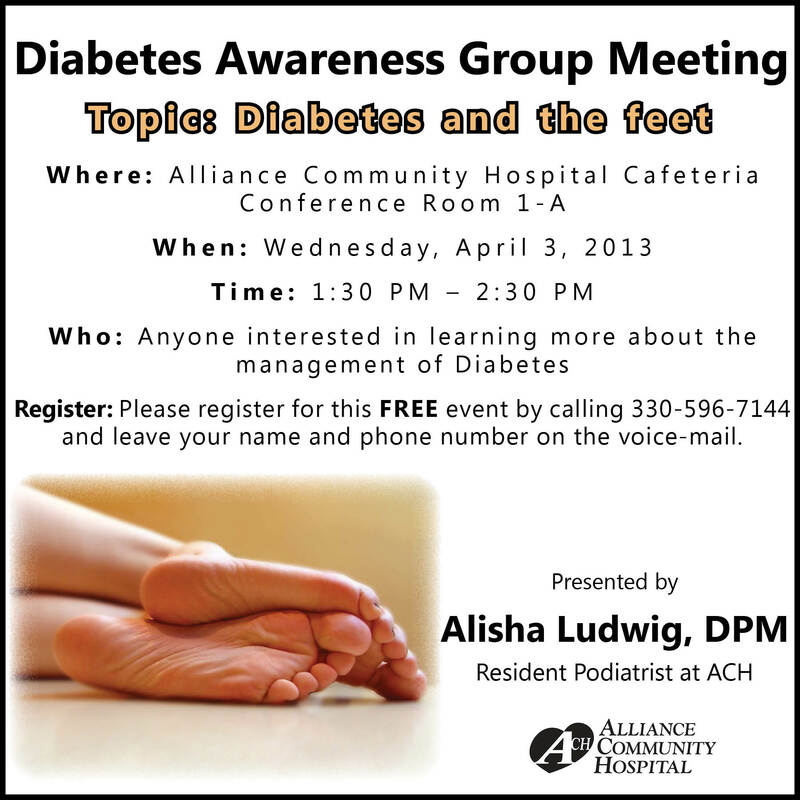 Join us on Wednesday, June 5, 2013, for a FREE Diabetes Awareness Group Meeting! The Group Lifestyle Balance program (GLB) will be offered at Alliance Community Hospital. 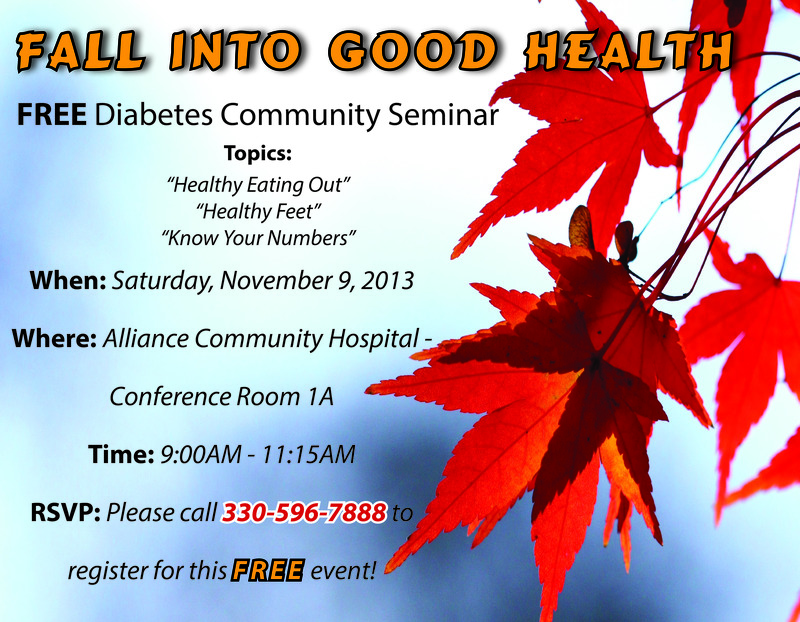 This is a year-long diabetes prevention program geared toward lifestyle changes to promote weight loss. The curriculum was developed by the University of Pittsburgh Diabetes Prevention Program. The class will meet weekly for the first 3 months, bimonthly for the next 3 months, and weekly for the remaining 6 months. The program for 2013 is scheduled to kick off in February and continue through December 2013. Participants must be willing to commit to changes in their diet and physical activity. Daily food intake and exercise must be monitored, while weight measurements will be taken each meeting. Physician completes Group Lifestyle Balance Program Referral Form and signs. Please include pertinent lab work on the form. 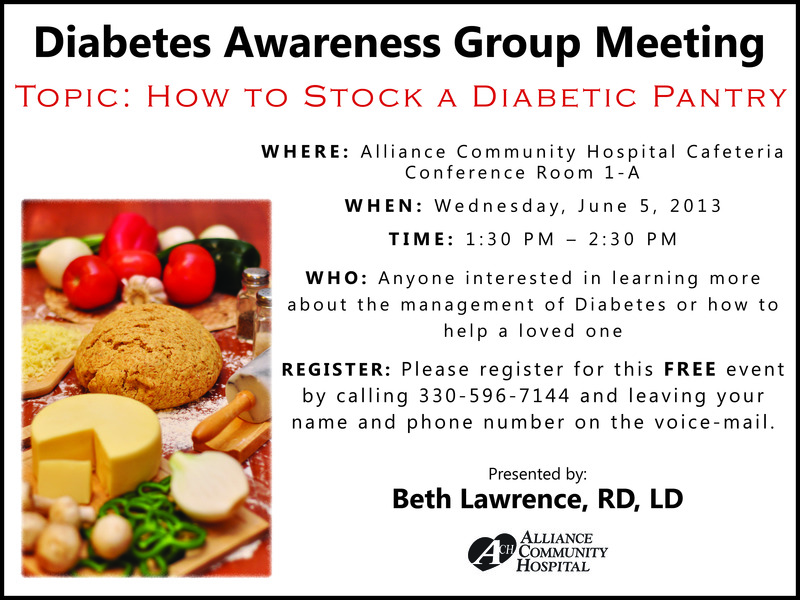 The participant is given the completed referral form and must contact the Educational Services Department at Alliance Community Hospital at 330-596-7888 to register. (Completed referral form must be turned in prior to Class 1 on February 5,2013). Class size will be limited to the first 20 eligible participants. The participant will receive a phone call from a GLB coach to confirm registration and answer any questions they may have. There will be a minimal charge ($50) for the course in order to cover materials. Payment is due by February 5. Please call ACH’s Educational Services Department at 330-596-7888 for eligibility information.